Voltron Legendary Defender Season 8 brought with it brand new uniforms for the paladins (and all of the Atlas crew). Obviously I had to make one. 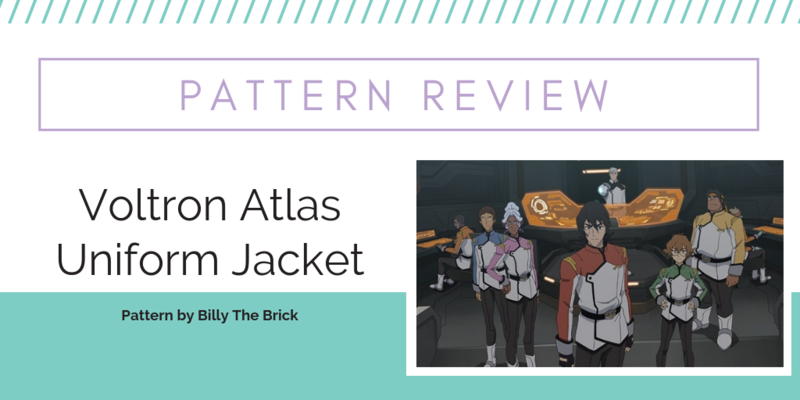 I was planning to do my normal pattern altering method but Billy The Brick on etsy came to my rescue and put out a pdf pattern of the jacket. He reached out to me and asked me to try out the pattern and provide feedback. He provided the pattern but all of the views in this review are my own. First, I decided to make this with as much as I could from my stash so I did deviate from the materials suggested by the pattern. I used Symphony Broadcloth cotton in white, green and black for the main jacket fabric and a gold satin for the shoulder/logo details. I also used sew on snaps instead of snap tape for the closures. The cotton I used is fairly light weight and while I think it’s great for the lining I would suggest using a heavier fabric for the outer layer as the pattern suggests. I think a fabric with more weight would lay nicer in the end. First things first, you’re going to want to print out everything. Make sure you print the page with the scale box first to make sure everything will print to the correct size. I had to scale my printer up to 102%. Once you confirm your printer settings than you can print all the pattern pieces. After that comes taping everything together. I found that my lines didn’t line up super perfect so I additionally retraced the pattern pieces on tracing paper like I do for every other pattern I use. The benefit of this is that I could true up my lines and won’t have to re-print if I decided to make the jacket in a different size in the future. I also decided to label my pattern pieces with what color they should be cut from to make it easier for myself later. Once everything was cut out I started sewing. I will say that the instructions are good but could be confusing at times. They often don’t make note of if you’re putting right or wrong sides together and sometimes the wording is a bot convoluted. I had a hard time figuring out what the instructions wanted me to do for the shoulder bars so I made it up. I will say that if you’re like me and rely mostly on pattern illustrations for your instructions than the instructions here can be harder to decipher. I do think my strong skill set helped me out a lot because of this. The instructions tell you to start with the lining before the outer layer. I decided to do some of the steps at the same time for both layers for efficiencies sake. I got both the lining and outer layer body pieces pieced together. Then I focused on fitting the lining before finishing up the outer layer. Fitting is the biggest thing that I had to conquer with this pattern. I am a very petite person so having to take things in is common for me. For this pattern I did have to bring the sides and under arm seam in between 1-1.5 inches. I also had to take about 5 inches off the length of the sleeves. However, the biggest thing I had to do was bring the shoulder seam up 2 inches, otherwise the sleeve would be down on my arm and would look really baggy/bad. Sleeve seams are the hardest alterations for me since they can cause other issues. I raised the seam so that it sat correctly on my shoulder but I do think in the end it caused some pulling across the bust and back. I think that this would have been less noticeable if I had been using a heavier weight fabric. I did only alter the body seam and left the shape of the sleeve pattern in tact. I mirrored the alterations on the outer layer. Then I finished putting everything together. Including making my own double fold bias tape to bind all the edges. I added the shoulder bars to the jacket before I put in the sleeves. For final finishing I added the button to the front flap and then sewed in a large snap behind it. I used 4 medium snaps down the straight edge of the front and 3 small snaps inside. Up top I used 3 small snaps to keep the top curve and collar closed. Once the snaps were sewn in the jacket was complete. On the whole I think this pattern is very well done. If you’re not comfortable altering or drafting your own pattern I think this one is a great base to work from. Like all patterns you will need to after it to fit you properly. I do also think that it’s better if you already have a decent base of sewing knowledge before taking this project on. The instructions are good but not always totally clear, especially if you rely on the visuals of pattern instructions like I do. The pattern does cover a good range of sizes too which is nice. You can find the PDF Pattern on Billy The Brick’s etsy shop here.